My master thesis at Aarhus University in 1995 treated the ancient fern family Gleicheniaceae for the Flora of Ecuador (published 2001) with description of three new species among a total number of 20. The work included drawings of all 20 species. In preparation for the contribution to the flora, a paper was published about the terminology that best describes the distinct leaf morphology within the family (1996). 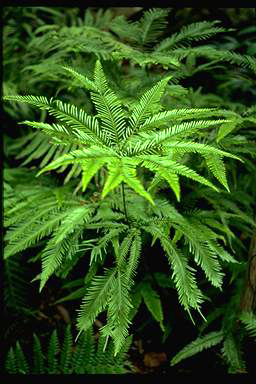 The fern family Gleicheniaceae consists of mainly tropical and southern hemispheric ferns, that are regarded to be among the oldest plants in modern times. They have not changed much since the dinosaurs were dominating the fauna of the Earth.